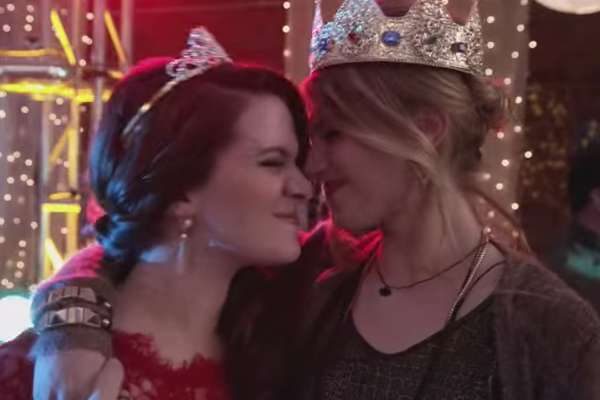 MTV's Faking It returns Monday for its sophomore season. In the comedy's first season, two high school teens fake being a lesbian couple in order to gain popularity. Despite their best efforts, Amy (played by Rita Volk) and Karma (Katie Stevens) are unpopular at Hester High. Their popularity soars when the best friends are mistakenly outed as lesbians at a party thrown by the most popular boy in school, who also happens to be gay, Shane (Michael Willett). They continue the charade to remain in the school's “in” crowd. Amy eventually reveals to Karma that she's fallen in love with her best friend. Karma confesses that she's dating Liam (Gregg Sulkin). After Liam, who was only attracted to Karma because he thought she was gay, swears off Karma, he and Amy, both drunk at the time, share a passionate kiss at a wedding reception. Showrunner Carter Covington discussed the show's premise in an interview with Refinery 29. MTV has already renewed the comedy for a third season.